Hello Friends! Welcome to our One Room Spring Tour! 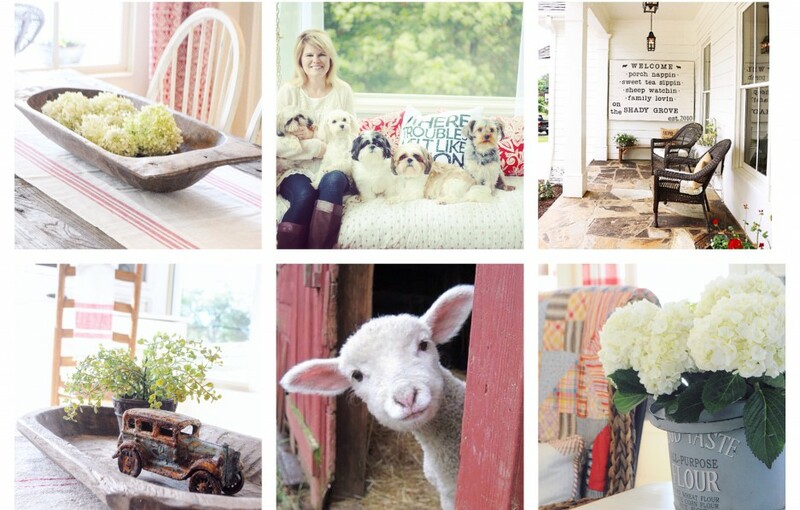 I have teamed up with 25 other bloggers to bring you a one room tour of our homes. Each day this week will be a new room of the tour. I have the pleasure of starting our tours off with my front porch. I’ll share how I bring spring to my front porch and you can also get links at the bottom of this post to see all the other blogs as well! I keep the landscape very simple in front of our porch. I waited a long time to have a home with a front porch and the last thing I want to do is cover it up with large shrubs. We selected dwarf gardenias because they stay a nice rich dark green all year and they stay small. Of course, the real reason we selected them was the heavenly aroma they give off during the summer. To the right of the front porch is a window box filled with all white flowers. This is my daughter’s room and I love being able to see the flowers from the inside as well. This area also has gardenias planted in front so they surround you as you walk up the sidewalk to the front porch. We installed a barn light over the window box to light it up at night and give this all white space some warmth. We replaced our painted front doors last year with these simple but beautiful stained doors. I love the warmth that the stain brings to the white exterior and the simple glass invites you to come in and visit. The happy red geraniums flank the front doors, and my sweet friend Tracy of Charlie and Ella made the “There’s No Place Like Home” sign that hangs beside the doors. To the left of the front doors you will find our sitting area. There have been many evenings spent sitting here, watching our teenage boys play basketball. Two of our four boys are now married and while the games are not as often as they used to be, they are still just as competitive. I made this sign last year out of the shutters we removed from the exterior of the house. It was really quite simple but I feel it adds so much southern charm and character to an otherwise simple space. I drilled some holes in the bottom of a red metal wagon and turned it into a planter. I also use old metal bowls and vintage coke crates to add more character to the space. You want to find the right balance of character and cozy but not cluttered. I keep my decor and flowers limited to 2 colors along with the green of the foliage and this seems to help it feel “full” but not crowded. I can use the vintage coke crate as a serving tray for lemonade or sweet tea or I can fill it with patriotic decor for Memorial Day and the Forth of July. Thank you for visiting the Shady Grove! I hope it has inspired you to bring some spring touches to your outdoor space. Please visit all my other One Room Spring Tour friends and enjoy a week of inspiration! Wendy your porch is lovely. So cosy! Love the signs,the wagons,the Coke crates- in fact everything! Here in England we don’t tend to put geraniums out till May/ June because of frost. Also gardenias are used as house plants. I bet your yard smells gorgeous! Hi Wendy! beautiful!!!! I would love a picture of your house. Can you send me one? We are building a house and I love the white and white stone but need a over all picture. Thank you for all your posts !! So inspiring. Your front porch is so welcoming and beautiful! Such a welcoming porch! Everything looks beautiful! Wendy, your beautiful southern home makes my heart smile! I’m always inspired by your thoughtful and oh so refreshing designs😍😍 thanks so much for sharing and always being so sweet and encouraging! You know that your porch is one my FAVORITES!!! I love that little wagon with flowers, so perfect!!! Love it all sweet Wendy!! I am so inspired – your porch is amazing!!! I adore the sign you made, your beautiful window boxes, and the whole light and bright feel of the space. Just lovely! 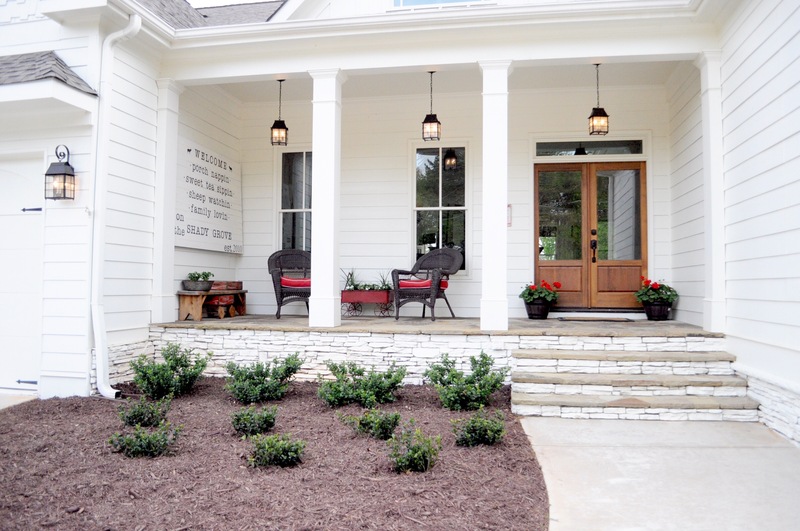 You know I love everythung about your beautiful home, but I am absolutely smitten with your front porch! So gorgeous!! I’m smitten with your entire house!!! That front door is exactly what I am looking for! Can you provide the product information? They are from a local building supply. I love those front doors! Can you share the source? We have a 1900 home and I feel that those doors would match the look of the home much better than the current 1980s front door. Love your front doors! (And your hanging porch lights!) Were these custom built or can you recommend where these can be purchased? We are about to replace our double French doors and I would love to have this style! 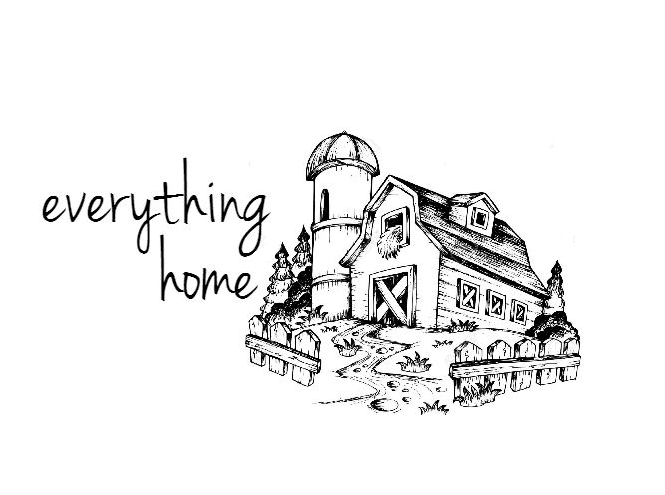 Pingback: One-Room Spring Tour Blog Hop is here!